About two years ago, I saw one of those motivational pictures on Pinterest that said, “If you can’t stop thinking about it, it’s worth going after.” It didn’t attribute the quote to anyone in particular, so I can just assume that it’s a general piece of life advice like, When you fall off the horse, get back on again. It doesn’t really matter, though, because these words really spoke to me. I framed it a bit differently in my mind at the time, but I never forgot about this sentiment. As a 5th grade teacher, I came home from incredibly stressful days at school and baked chocolate chip cookies or cupcakes. It was honestly my stress relief and was so relaxing after a long and hard day. Don’t even get me started on all of the baking shows that were on TV! 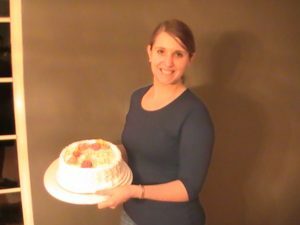 It was a few years later, but before my second child was born, my mother took me to see Buddy Valastro, “The Cake Boss,” when he came to the Palace Theater on tour. When Ryan and I moved back to PA in 2009, I was on the substitute teacher list in a local school district, but I wanted to have something else to do to occupy my time. Cake decorating popped into my head and I decided to take a Wilton Level 1 class at Michaels. I was so excited and looked forward to class each week. I quickly discovered that I was actually pretty good at piping roses and shell borders. The culmination of the course was a fully decorated layer cake. I can honestly say that I remember baking this cake. 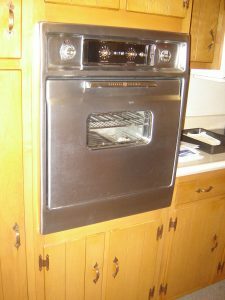 It is the only thing that I distinctly remember making in this oven. We were in the middle of ripping up carpet and painting every single wall in our new home, so I dug my mixer out of storage and multi-tasked. 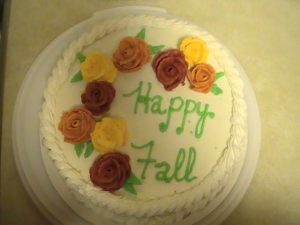 It was October, so I chose to make a pumpkin cake with a cinnamon buttercream filling. I baked those cake layers and colored the frosting for my roses while waiting for coats of paint to dry. This was the day that the counter space across from the oven became my “baking spot”. It still is to this day, even though we have new countertops and a new oven in a different spot. I thought my cake was just beautiful! It amazed me that simple ingredients like flour, sugar, and butter could combine to create something so delicious and pretty to look at. I was so. proud. of. this. cake. 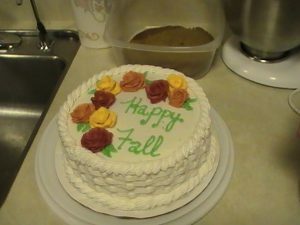 So proud that I actually stopped at my parent’s house on the way home from class to show them my cake. They didn’t know to expect me, so they weren’t home, but I DROVE OUT OF MY WAY TO SHOW MY PARENTS A CAKE. I was so proud that I took multiple pictures of the cake from multiple angles. I was so proud that I had Ryan take a picture of me with the cake. I was 23 years old, acting like a 5 year old who is so excited and proud to show off her piece of artwork. But that’s exactly what it was to me, and still is to this day. Cake decorating is a form of art. It is a creative outlet that brings happiness to people, including those who create the pieces. It’s my happy place and a way to add something beautiful to this world. It all started with this first cake. I didn’t want to stop there. Aside from that Wilton course, I am entirely self-taught. 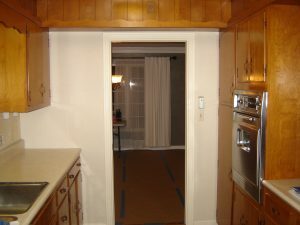 I have spent hours and hours in the kitchen perfecting my recipes and techniques, watching tutorials, and reading baking and decorating blogs. I have shed several tears and lost countless hours of sleep over cookies and cakes. I have spent more time than the average person thinking about sprinkles. My heart and soul go into each piece that I create and I hope that my love and dedication come across to those who see my work. I know that there are amazing things to come in the future for Four Oaks Bakery and I am so honored that you are on this sugary ride with us! Thank you for the kind words! I hope you continue to enjoy the blog.